In mid-April, I received this interesting e-mail. Jane also sent some pictures along with her question. These bees are solitary ground bees (Andrenid bees), sometimes called “mining bees” and it appears that they have decided that Jane’s lawn is the perfect place to dig their nests. The problem is that once they find a nesting site they like, many future generations will continue to nest in that same location unless the conditions change and become unfavorable. This can be annoying if it happens to be in the middle of your lawn as in Jane’s case. 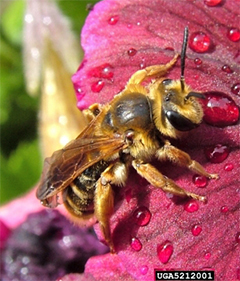 Andrenid bees are important pollinators and should not be killed unless they pose a real problem or danger. They are usually only around for about four to six weeks in the spring and unlike the social bees (e.g. yellow jackets and hornets), these solitary ground bees are not aggressive and generally will not bother or attack you. They are actually very docile critters as Jane says; in fact only the females have stingers (which are actually modified ovipositors) but they generally don’t sting unless they are really provoked or happen to get stuck in your clothing. The males lack a stinger all together. hole of its nest. Nice photo Jane! Solitary ground bees emerge from their underground nests in the early spring. Male bees usually emerge first and hover low over the ground waiting for the females to come out. Once the females emerge and mate, they begin digging their nest in the ground. The entrance hole of the nest is about 1/4″ in diameter (about the size of a pencil) and is often surrounded by a mound of loose soil. The nest consists of a main tunnel that goes straight down (up to a foot deep) with many small chambers about ½ inch long going off to the side. Once the nest is built, the female bee collects pollen and nectar from spring blooming flowers and brings it into one of the chambers. She forms the pollen and nectar into a ball about the size of a pea and then lays a single egg on it. Once the egg is laid, she seals off the chamber and repeats the process until all the chambers in the nest are filled with food and an egg. 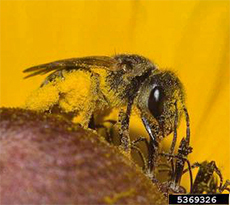 When the eggs hatch, the larvae feed on the pollen/nectar ball. They molt several times before they pupate and eventually emerge as an adult bee. The adults chew their way out of the chamber during the warm days of early spring and leave the nest through the main tunnel. There may be more than one generation in a season but the last one will overwinter in the nest and emerge in the spring. 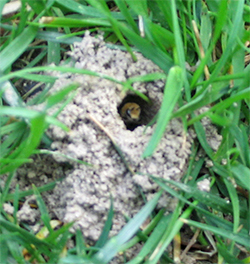 Solitary ground bees prefer to nest in dry, well-drained areas with sparse vegetation. If they nest in the lawn, it’s usually in an area where the grass is thin. Sometimes there can be large aggregations of nests in an area (as in Jane’s case) and this can be both bothersome and alarming to the homeowner. These bees are great pollinators so we recommend that you encourage them to move on rather that trying to kill them off. Since they avoid damp areas, one way to discourage them from nesting in your lawn is to set up a sprinkler and drench the area with about an inch of water once per week during the nesting period. Start this when you first start seeing them hovering around in the spring. This is not a permanent solution, though and they may well return the following year. 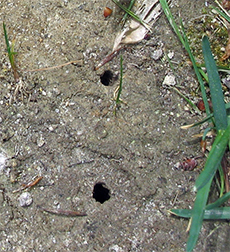 Ground bee holes in bare soil. The best way to send them packing permanently is to change the conditions that make your yard attractive to these ground nesting bees. 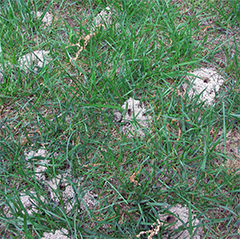 A healthy, vigorous lawn makes a terrible nesting site for ground bees so keep your lawn adequately fertilized, properly watered, and mowed at the correct height to encourage the growth of dense, lush grass. A thick layer of mulch will usually prevent them from nesting in your gardens since they prefer to nest in bare ground. Special thanks to Jane for sending me these photos of her bees! On Mother’s Day, I enjoyed a wonderful walk through the U.S. Botanic Gardens and Conservatory in Washington, DC with my sister and my daughter. What a great way to spend Mother’s Day! 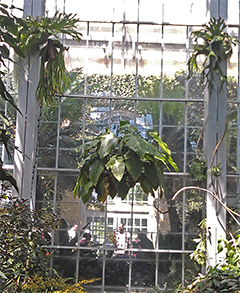 The outdoor gardens were beautiful but we especially enjoyed the gardens under glass in the Conservatory. 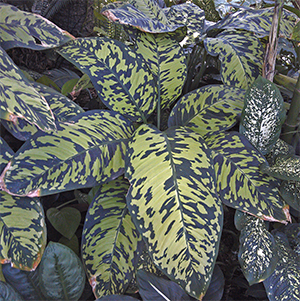 These were magnificent – especially the jungle room. 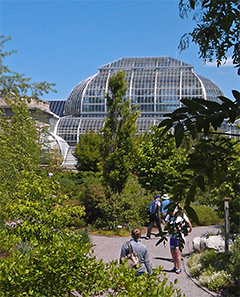 In 1997, the U.S. Botanic Garden Conservatory was closed to the public and completely renovated during a major project that lasted four years. It was reopened in 2001. The renovation was mostly done to modernize the climate control systems, plumbing, electrical, and to replace the aluminum framework and glazing of the dome; the exterior was kept pretty much unaltered. The climate inside the building is now completely controlled by computers that monitor the outdoor weather conditions and automatically adjust the shading, ventilation, misting, and heating so that the daytime and nighttime environment is ideal for the different gardens. 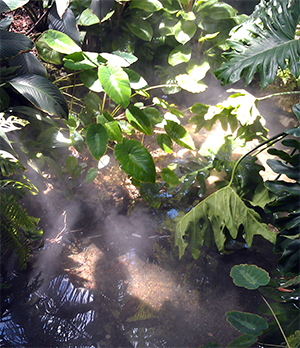 The Garden Primeval was one of the first gardens we walked through. It was created to give you a feel for what a Jurassic forest might have been like and is full of many different types of ferns, cycads, and other ancient plants that are still around after millions of years – a very fascinating garden. 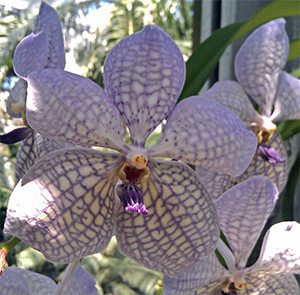 The orchid room was spectacular! 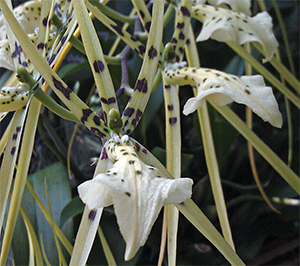 There were hundreds of different orchids which provided an amazing diversity of form and colorful blooms. They were all displayed in a beautiful natural setting. 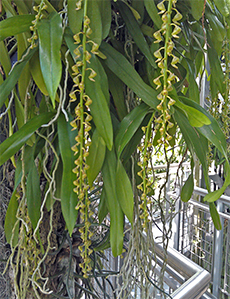 At one point, you walk under a big log which is suspended over the pathway and is completely covered with blooming orchids. Wow – I can’t believe I didn’t take a picture of it! The desert room was really interesting as well with plantings of a variety of cacti and other succulents and grasses that are specially adapted for arid conditions. I must say though, the jungle room was my favorite. 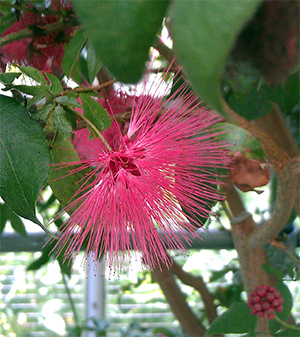 It is a tropical rainforest housed in the tallest part of the conservatory under a glass dome which rises to 93 feet. There are several walkways that meander through the lush forest floor, over low bridges and under towering trees. The neatest part was the canopy walk that takes you high up into the dome and allows you to walk in the midst of the jungle canopy and experience these magnificent trees and tropical plants from above. It was very cool. 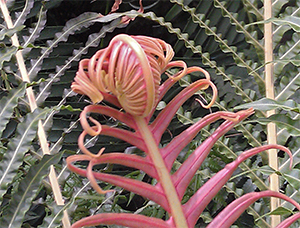 As we walked around the various gardens, we became especially fascinated by the intricate details of some of the plant structures, flowers, and leaf patterns. I didn’t have my camera with me but it’s amazing what you can do with a cell phone! 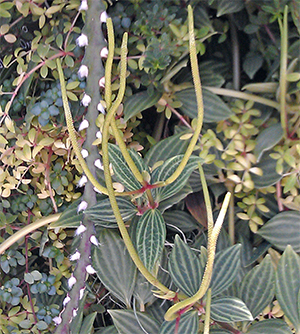 I’m including some pictures of this unique plant “art”. 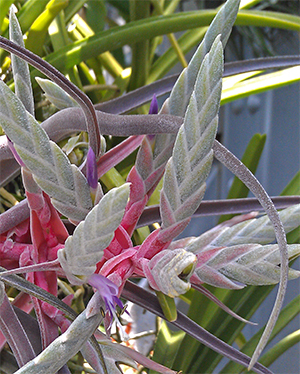 We thought it was really cool – too bad I didn’t think to write down the names of all the plants! Oh well – I’ll get Andre to identify them for me. 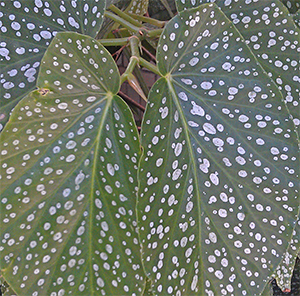 The patterns and colors of the foliage were really interesting! 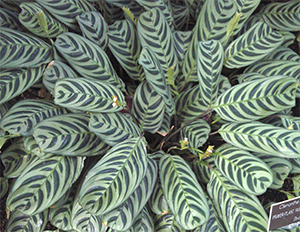 This variegated prayer plant almost made me dizzy! 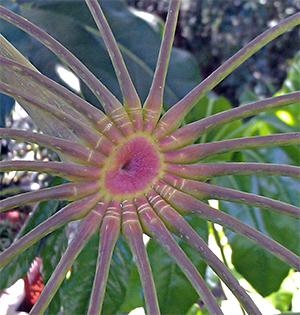 pattern where the leaflets join the stem. 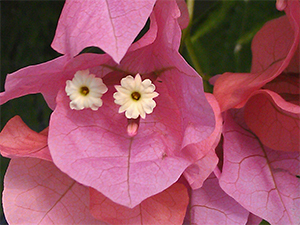 There were some really interesting flowers all through the different gardens! had written down what it was but Andre will know! A beautiful orchid up on the canopy walk. I urge anyone who visits our nation’s capital to plan on spending some time at the botanic gardens. 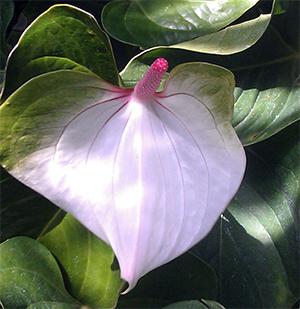 It is well worth the time if you have a love of plants or even just a love of all things beautiful! You won’t be disappointed! All Ready and Rarin’ to Go! Eric and I spent most of Saturday and Sunday in the vegetable garden getting it ready for the coming planting season. Eric cut down two cedar trees that were shading one end of the garden while I tilled the area for the tomatoes and cukes and set the trellises. 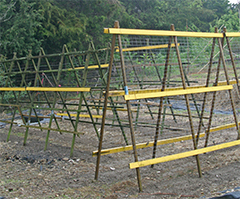 Our 6 trellises are set and ready to plant. We’re just waiting for warmer nights. The weekend was warm and beautiful but the nights have become cool again – too cool really for putting out tomato plants especially since our last frost date here is May 15th. The warm days made it very tempting to plant but when I thought of all the time that went into growing my beautiful, healthy tomato plants that temptation waned pretty quickly. It would cost a small fortune to replace the plants (I have over 50 plants) if we happened to get a late frost and many of the heirloom varieties I grew could not be replaced from a store anyway. So they remain on the deck in our cold frame which gets covered at night if the temperature is forecast to go below 50oF. Now I heard it is supposed to dip into the 30’s Monday night! Gosh, I might have to bring them indoors! Well at least they’ll be nicely hardened off when planting time comes, so we’ll be able to pop them right in the ground. ago. They are twice this size now! I have prepared a wonderful, fluffy soil for the tomatoes. The bed is tilled nice and deep thanks to my good old tiller and I have amended the soil with Espoma Tomato-tone, rock phosphate, and some of the good Blue Ridge Organics Super Compost. 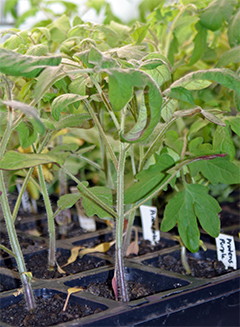 Tomato-tone is a great organic fertilizer for tomatoes because it has added calcium which helps prevent blossom end rot. I have decided that my experiment of starting my tomato and pepper seeds in the Blue Ridge Organics compost was a success. They grew really well. In fact, they grew so well and so fast that I now realize that I should not have started them so soon. I didn’t expect them to take off like they did – it’s never happened before. That’s one of the reasons I was tempted to plant them last weekend plus the fact that I won’t be home to plant this weekend or next weekend. The lettuce hits the top of the cage now! The lettuce that I seeded in the cells grew really well, too. About 5 weeks ago, we separated the seedlings in each cell and planted them out into two of our large square containers on the deck. 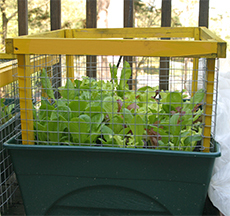 We put cages around them to keep the pesky squirrels out and covered them with row cover for a few days since they weren’t hardened off. They thrived in these containers which I also spiked with Blue Ridge Organics compost. I love this stuff! We have been eating fresh lettuce in salads now for almost 3 weeks. few days until the plants were hardened off. 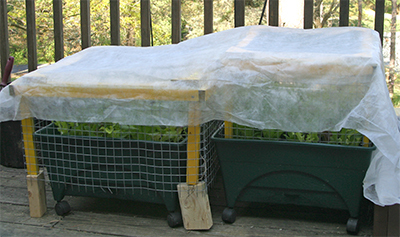 When I harvest, I use a knife to cut the lettuce about an inch above the soil level. This way the lettuce is so clean, I don’t even have to wash it. 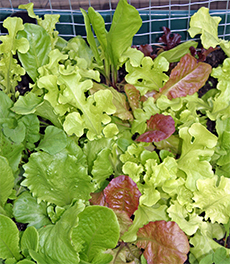 It also leaves the lettuce crown and roots intact to continue producing more lettuce. Fresh leaves are already growing on these plants and soon I’ll be able to harvest from them again. Now that I think about it, it doesn’t really matter that I will be away this weekend because it will be way to wet to work in the garden anyway. We’ve just had at least 3.5″ of rain with this weather system that has been sitting and spinning over much of the mid-Atlantic for the past three days and more rain is in the forecast. I’m concerned that the carrot and beet seeds that I planted on Sunday may have washed away or at a minimum become shifted in the beds so that my all my careful spacing of those tiny carrot seeds might now be all for naught! Bummer, I hate thinning (and replanting)! them from nasty green caterpillars. Here’s one last piece of advice – if you’ve had any where near the amount of rain that we’ve just had, don’t be tempted to go out and work in your garden! Working the soil or even walking on it when it is wet is a really bad thing to do. It destroys the soil structure by compressing the soil particles tightly together so that the pore spaces that hold air and water are lost. It can quickly turn good soil into something akin to concrete. 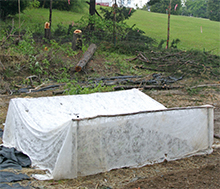 Wait until the soil has had a chance to dry before returning to your tilling and planting. You’ll know the soil is okay to work when a handful of soil squeezed into a ball breaks apart when you tap on it. Be patient! Soil structure, once ruined, takes a long time to rebuild. Oh my goodness, what are those bugs all over the side of the building! They are everywhere! This was the talk of the nursery last week when hundreds of lady beetle larvae (a.k.a. ladybugs) crawled up on the white cinder block walls of the nursery office. It was fascinating (yes, I’m a biologist at heart)! At least they were on the outside of the building and not on the inside. I know these lady beetles can be a nuisance at times when large numbers of them find their way into our homes; but at least these aren’t bad bugs like the stink bugs that get into our homes and also damage our fruit and vegetable crops. I’ve been fighting with these nasty creatures in my house all spring. I can cut a little slack for the good guys because I know they will eat a lot of the bad guys! 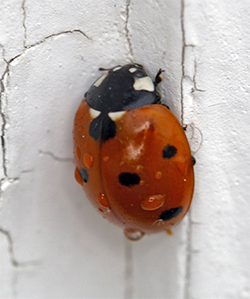 Lady beetles are one of the good guys – although unfortunately, they don’t eat stink bugs. They are beneficial insects that, in both their larval stage and adult stage, consume large numbers of aphids (their preferred food), scale insects, mealybugs, thrips, and mites. I was very happy to see them because I had just noticed some large concentrations of aphids on some of the daylilies in the gardens. 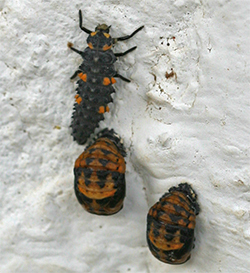 Lady beetle larvae can eat up to 25 aphids in a single day and the adults can gobble up at least 50 in a day! When their populations are high, these ravenous critters have the potential to reduce the numbers of aphids and other soft bodied insect pests to the point where spraying is not necessary. They are great natural predators to have in the garden. 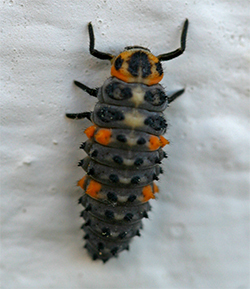 The larval stage of the lady beetle is described as being “alligator-shaped” – fitting for its predatory nature. 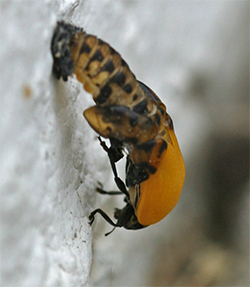 It goes through four different instars, becoming larger (and more voracious) each time. The larvae that crawled up on our building were the last instar and many of them had already begun to pupate when we noticed them. This last larval stage becomes relatively sedentary before it attaches itself to a substrate (in this case the side of our building) to pupate. 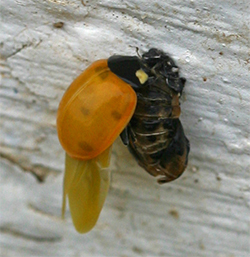 The pupa stage lasts from 3 to 12 days depending on the species (and the temperature). 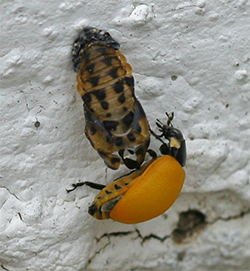 When the adult beetle of this particular species emerged from the pupa case, it was a bright golden yellow color. Not at all what I was expecting; but as the exoskeleton dried and hardened, it slowly changed to the more familiar orangey-red and the black spots began to appear. I don’t really know how long this transition took but it occurred within a matter of hours. appearing. The wings are extended. The whole metamorphosis was quite interesting. 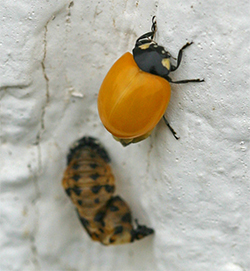 For several days, I could see three different life stages of this colorful predatory beetle on the building at one time; larva, pupa, and adult. Today, I could find only pupae, empty pupa cases, and a few adult beetles. 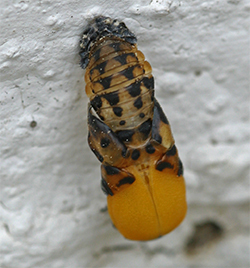 The larvae have all moved on to the pupa stage and beyond. I’m hoping that the adult lady beetles have flown off to the gardens and that they are happily munching on all the aphids, mealybugs, and scale insects that they can find on Andre’s plants. Another mighty predator for the garden!